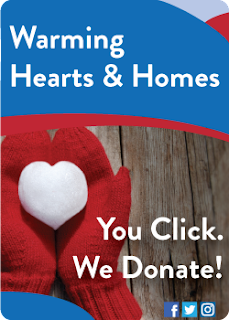 Community Financial Money Matter$ Blog: Warming Hearts & Homes is Back. You Click and We Donate! Community Financial Credit Union is excited to kick off the holiday season with the return of our 5th annual Warming Hearts & Homes charitable campaign! Throughout the month of December, Community Financial will donate up to $40,000 to local nonprofit organizations that provide heat, food, shelter and clothing to low-income families. The winter months can put an extra strain on some families, forcing them to choose between paying utilities and putting food on the table. That’s why the Warming Hearts & Home program was created and why Community Financial remains dedicated to supporting the fight against cold and hunger in Michigan this winter. As a member of our community, you’re invited to participate in this year’s campaign by getting social with us! Week one, December 4-10: Helps The Heat and Warmth Fund (THAW) provide emergency energy assistance for individuals and families. Week two, December 11-17: Assists both Habitat for Humanity of Western Wayne County and Otsego County Habitat for Humanity in providing safe and adequate housing for those in need. Week three, December 18-24: Aids the Salvation Army’s “Coats for Kids” program. Week four, December 25-31: Helps stock the shelves at Gleaners Community Food Bank.